 We have 8 Rehearsal rooms available for hire by the Hour, Day, Week or Month ranging in size from 200 Sq ft (18.58 Sq m) to 800 Sq ft (74.32 Sq m). The spaces are modern light and offer absolute privacy for the client. Built utilising floating floors to minimise bass leakage between rooms, divided by 4” thick solid concrete walls and tuned with custom built acoustic panels. The rooms sound natural without being too lively, so you can actually hear what your playing. All the regular rooms are located on the ground floor, hourly rooms supplied with PA system. We have on site Resident Rooms, rentable by the month or week. Residents have 24 hour access to their rooms (by prior appointment), use of all on site facilities and each room comes with it’s own hard wired internet connection, plus, discounted rates on recording and equipment. From £9:00 – per Hour – including PA.
From £70:00 – per Day – including PA.
From £200:00 – per Week – including PA.
For Rehearsal rooms booked by the hour, this includes loading and unloading time. The minimum booking period is 1 hour. We operate a 48 hour cancellation policy, cancellations are charged at a flat fee of 2 hours (£18:00). Failure to arrive for a booked session will be charged the full session fee (including any reserved backline). We Have A Number of Resident Rooms Available by the Month. They are available on a first come basis so please ring for an enquiry.